Ronald J. Rychlak is Mississippi Defense Lawyers Association (MDLA) Professor of Law and associate dean for academic affairs at the University of Mississippi School of Law. He has been a member of the faculty since 1987 and teaches, among other things, gaming law, environmental law, and evidence. Prior to joining the faculty at Ole Miss, Rychlak practiced law with Jenner & Block in Chicago, and he served as a clerk to Hon. Harry W. Wellford of the United States Sixth Circuit Court of Appeals. He is a member of the editorial board of The Gaming Law Review and a member of the National Association of Scholars, Society of Catholic Social Scientists, Fellowship of Catholic Scholars, International Masters of Gaming Law, and Phi Kappa Phi Honor Society. He is a member of the committee appointed by the Mississippi Supreme Court to revise the state’s criminal code and an advisor to the Holy See’s delegation to the United Nations, and he serves as a delegate at the United Nations meeting on the establishment of an International Criminal Court. In 2004, the Bush administration sent Rychlak to Paris to address the Organization for Security and Cooperation in Europe regarding the importance of free speech on the Internet. He is the author of Heartland Policy Study No. 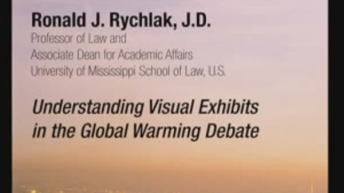 115, “Understanding Visual Exhibits in the Global Warming Debate,” to be released at this conference.